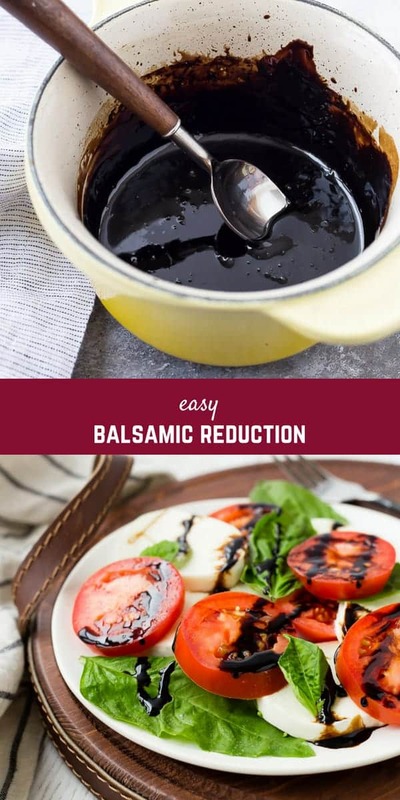 Balsamic Reduction is a simple sauce that can elevate a dish to the next level, and it’s so easy to make at home! It only takes one ingredient and just a little time to create this sweet, tangy, syrupy sauce. Last year, my basil did terribly. I don’t remember if I was even able to harvest any of it. This year, I’m sure I’ll try again because a sprinkle of fresh basil instantly brings a taste of summer to any recipe….and I love it so! My chives are already out of control, so at least if nothing else grows, I’ll have chives. The basil in these photos is compliments of the grocery store, but the caprese salad did not disappoint. 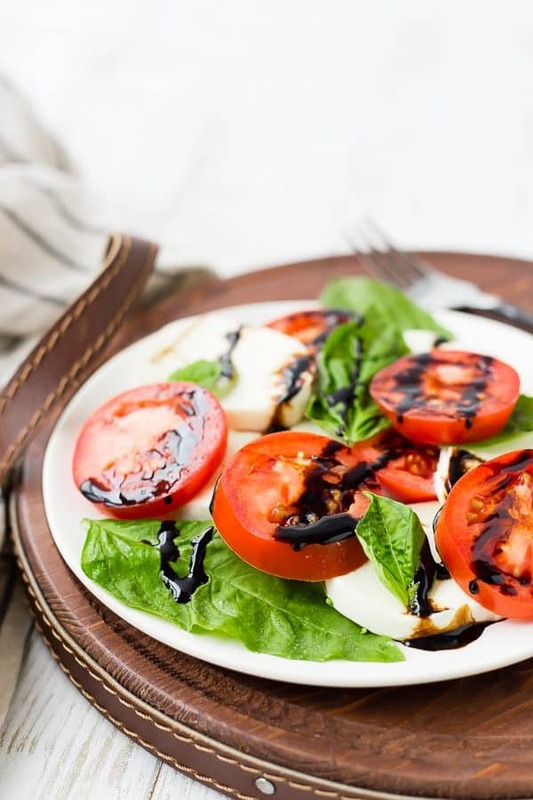 Caprese salad is one of my favorite things to eat all summer long. I don’t know what it is about the simple combination of tomatoes, basil and fresh mozzarella, but it’s a win every time. 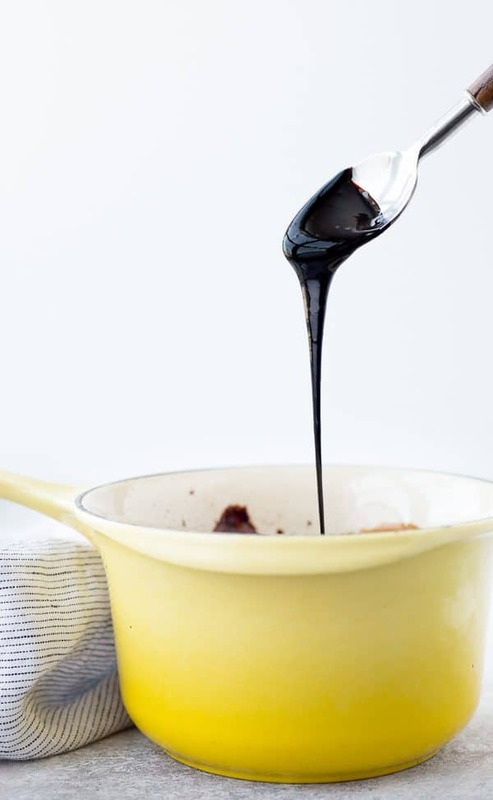 Whether it’s drizzled with high-quality olive oil or a balsamic reduction (or both! ), it’s always delicious. 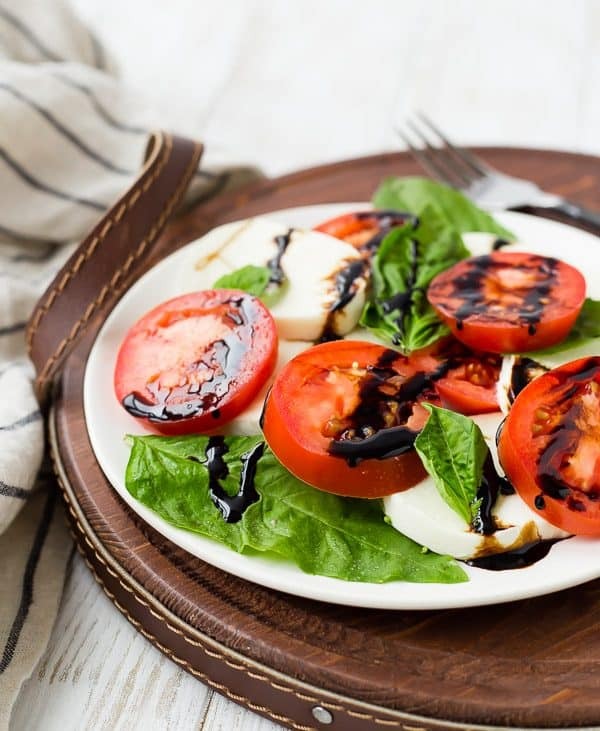 However, balsamic reduction (or balsamic glaze, whatever you prefer) isn’t only for caprese salad. It has the ability to elevate so many dishes like this asparagus tart or this bacon and mushroom flatbread. 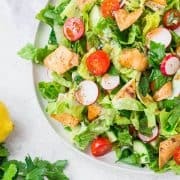 It’s great drizzled on grilled meat (it’s tasty on chicken or steak), salads, appetizers, and roasted or grilled vegetables. I personally love it on roasted or grill asparagus. It’s one of those things that you might not automatically reach for, but once you introduce it into your cooking repertoire, you’re always going to want a bottle of it in your fridge. 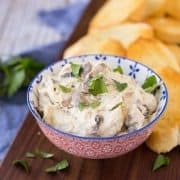 The great news is, it keeps for a month or more in your fridge, so you can make a big batch and it might last you all summer! Or it might last you two days, once you taste it. You guys, I can’t stress enough how easy this is! It’s SO EASY. You literally just simmer balsamic vinegar until it thickens. That’s it! If you want this to be even more sticky sweet, you can add some sugar or honey to sweeten it up a touch. 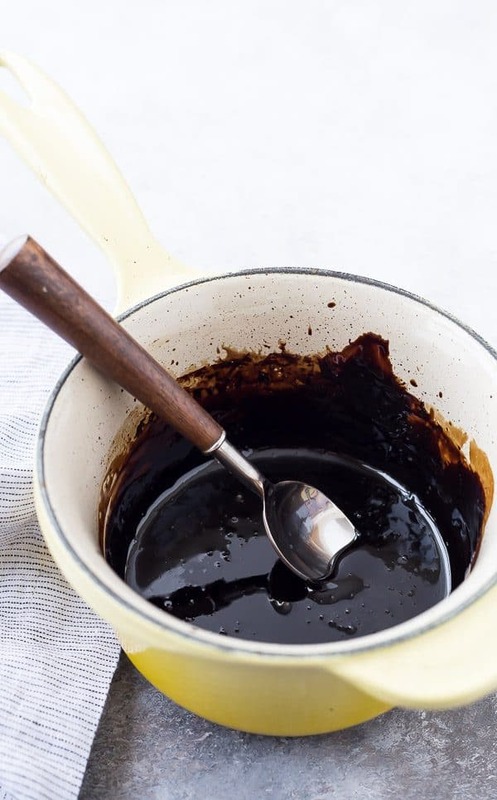 I find that the vinegar gets sweet enough as it simmers down and reduces, but I am used to things on the less-sweet side, so if you have more of a sweet tooth, you might want to try adding a couple tablespoons of sugar or honey. Heat vinegar in a saucepan over medium heat until bubbling. Reduce heat to medium-low and continue to simmer until reduced by about half and thickened. You can stir it occasionally but just keep an eye on it to make sure it’s not boiling rapidly…just a low simmer is perfect. 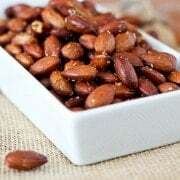 Cool and store in fridge for up to a month. If you prefer this sweeter, add 2 tablespoons of a sweetener of your choice. Honey, brown sugar, or granulated sugar are good choices. Verdict: I love this stuff, I want to pour it on everything! It kind of makes your house smell like vinegar while it reduces, but it’s worth it, plus there are worse smells in this world! I just diffuse some essential oils and my house smells fantastic again. 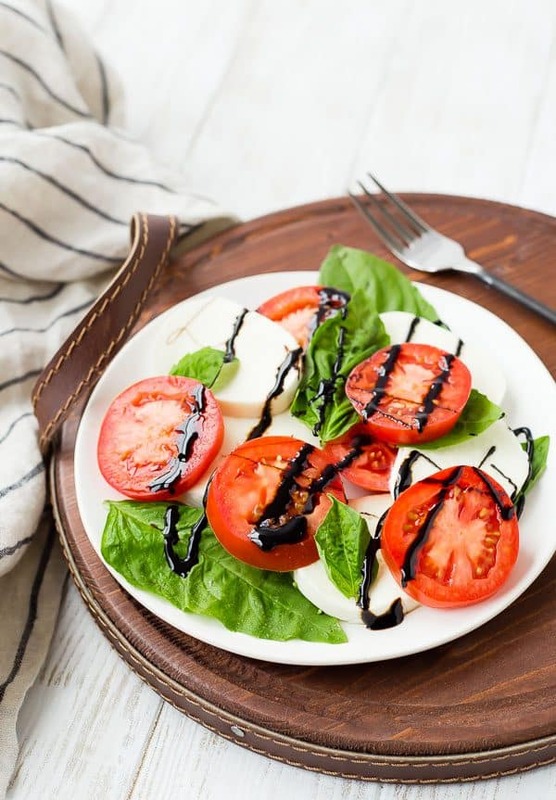 Husband’s take: Ben loves caprese as much as I do and when I drizzle on this balsamic reduction, he can’t get enough! Changes I would make: None are necessary, but like I mentioned, I prefer it without sugar, but if you like things sweeter, add a touch of sugar or honey! 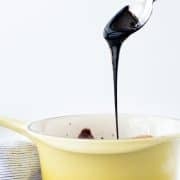 If people like sweater, drop the balsamic by a 1/2 cup and add in the same amount of a good maple syrup. PERFECT on pork. Great tip! So good on pork! Thanks Rob! I love balsamic reduction! Definitely a staple around here! This turned out so well and it was so easy to make! It’s not going to last very long because I’ve been drizzling it over everything! I’m so glad you like it, Shannon! Thanks for taking the time to come back and leave a comment!